Media Duopoly: For Netflix's Ted Sarandos (left) and Reed Hastings, strong original programming is the key to global growth, as buzzworthy tv series and movies draw in more subscribers. “The new normal” might be a stretch, but there is no doubt that binge-watching is starting to change viewers’ habits and expectations. Even traditional TV networks like TNT are taking a cue from the leading streaming player, experimenting with their own binge-worthy releases of entire seasons. 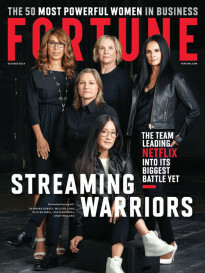 But binge-watching is just one of the ways Netflix is disrupting the Hollywood ecosystem, as chronicled in a recent company profile in Fortune. Here are three other ways the Silicon Valley company is shaking things up in Tinseltown. 1. They’re bidding big for talent. Netflix isn’t just disrupting TV land. It is encroaching on the big screen too, increasingly outbidding incumbent studios. Take Bright, a Will Smith cop thriller it snapped up for a reported $90 million earlier this year. The hefty price tag means Smith and his cohorts are cashing in big on the Netflix deal, even if it doesn’t include a so-called “back end” fee—the cut top talent receive in traditional studio deals from box-office sales, global distribution, and syndication, all of which are virtually non-existent with the streaming service. Netflix replaces back end fees with generous payments upfront, which stars are increasingly drawn to. The company will spend $5 billion on content this year alone, including film projects with the likes of Brad Pitt, Eric Bana and Ellen Page. Concussion, starring Will Smith, comes out in December. 2. They’re staying mum about their ratings. For all of the viewer data Netflix collects, no one but the streaming media company actually knows how well particular shows and movies perform with subscribers. Why? Netflix has no incentive to share this information with Nielsen or the public, because its business model is all about growing its subscriber base, not selling ads. The company isn’t the first to introduce commercial-free programming (hello, HBO), but its scale and scope means it is eating into traditional networks’ ability to command top prices for advertising. Non-streaming TV viewing in the U.S. fell about 3% last year in terms of hours viewed, and analyst Michael Nathanson of MoffettNathanson has estimated that Netflix accounted for about half of that decline. Unfortunately for Netflix, its lack of transparency also means it can’t prove that its hits are really beating the competition. A screen from Netflix's promo for the 4th season of 'House of Cards'--which may or may not be drawing huge audiences. Netflix has been one of the biggest critics of the way that movie-theater owners run their business. In a recent interview with Fortune, CEO Reed Hastings lamented the “lack of innovation” in the industry. The company takes particular issue with the “theatrical window”—the amount of time that theaters have exclusive rights to a film—which is something the National Association of Theatre Owners, the industry’s biggest trade organization, has no plans to do away with. That hasn’t deterred Netflix. Last year, the company launched Beasts of No Nation in theaters at the same time it made the movie available to its streaming subscribers online. Only a handful of small theaters actually agreed to show the film, but you can bet Netflix—and others—will keep experimenting with the model, eventually forcing the theaters to respond. In the meantime, movie attendance has flatlined in recent decades. Despite a small overall attendance uptick in 2015, nearly a third of the population of North America didn’t set foot in a theater last year, and another 10% went only once. Netflix's "Beasts of No Nation," starring Idris Elba, was simultaneously released on its streaming platform and in theaters. 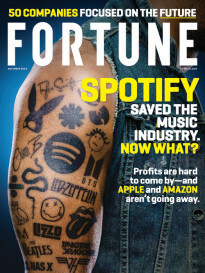 To learn more about Netflix’s disruption of Hollywood, read this feature from the Fortune 500 issue of Fortune magazine.